← January 22, 2013 Big Ahis and Mahimahis Today! 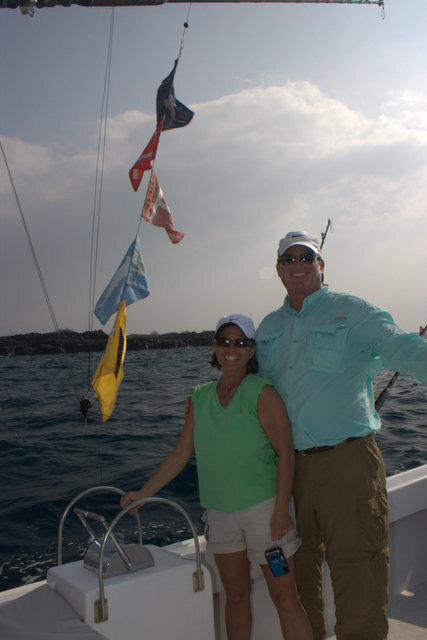 January 29, 2013 Mike and Linda Score 3 Spearfish and Mahimahi! Mike and Linda joined me today for their first day of a three day charter. Mike and Linda come here almost every Spring and have fished on a few other boats so the pressure was on to get them into fish. The short nose spearfish bite has been pretty good the last few days so that’s what we decided to target. 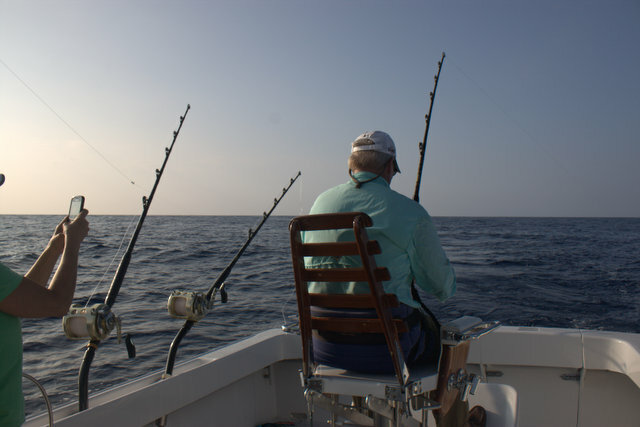 We headed north out into the deep well past the 1000 fathom line and trolled the deep. 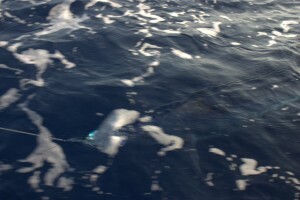 As we passed the 1200 fathom line the longrigger came down with a solid bite. Linda was first up and strapped herself into the chair. Right-off-the-bat we knew it was a short nose spearfish just by the way it fought. As I grabbed the leader I saw that this was a big spearfish of at least 40lbs. We decided to take it since they were staying at a condo and wanted some fillets to take home. 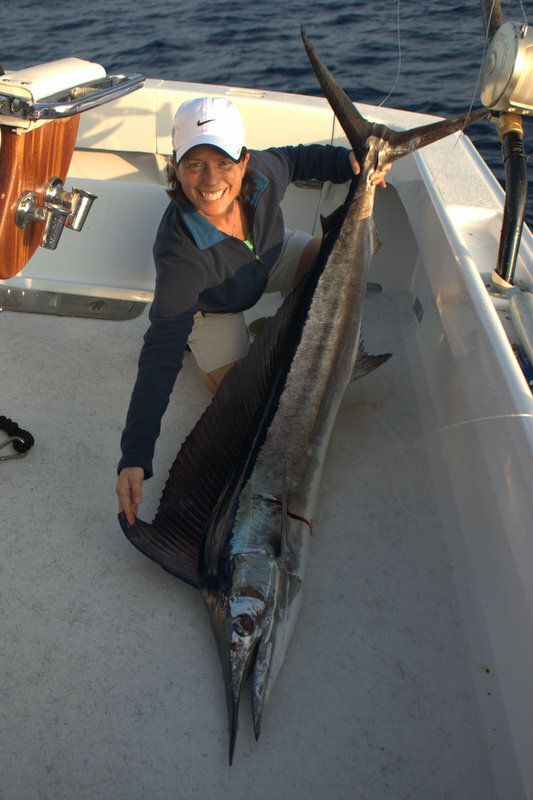 Linda landed her first ever billfish in about 10 minutes! We reset the lines and continued out into the deep. About 30 minutes later the long rigger again came crashing down with another spearfish bite. This time Mike was up and angled a smaller spearfish about 30lbs to the boat. Since we already had one in the boat we decided to release this one to fight another day! As I started to reset the lines the short rigger came down but whatever it was we missed it. I got all the lines set-up once again and a few minutes later another short nose spearfish ate the long rigger and came off! It dropped back to the stinger and this time the hooks set solid! 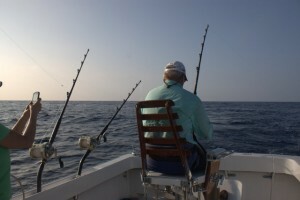 Mike was still sitting in the fighting chair so he got buckled onto the rod. 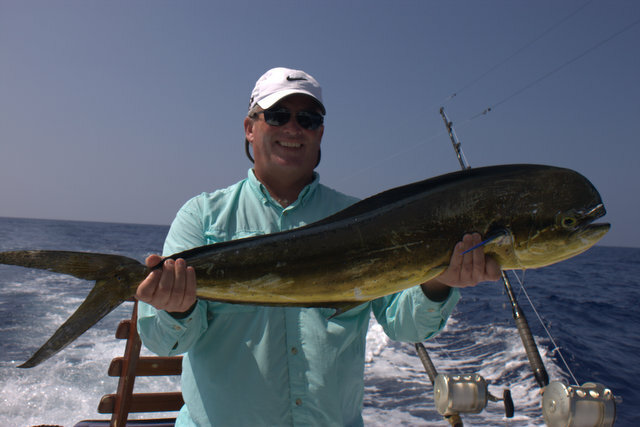 He fought his second short nose spearfish to the boat in about 10 minutes. Again, we decided to release the spearfish, his second of the day which weighed about 25lbs. With three short nose spearfish under our belt we decided to pound the area. I worked and area about 2 miles by one mile. Our third bite came in the same area, another spearfish but it soon came off! Our next bite came a little later in the day and Mike fought a nice mahimahi to the boat. This one went into the fish box for them to take home for dinner! It weighed about 18lbs! We would continue trolling for the rest of the day and end up with three nice short nose spearfish from 25-40lbs and one 18lb mahimahi! We also missed three other short nose spearfish! The bite is really good right now and hopefully we continue to get more bites in Mike and Linda’s next 2 trips this week!